An important food crop for humans and farm animals, corn (Zea mays) grows quickly when soil and air temperatures remain warm and moisture plentiful. Avoidance of freezing temperatures and drought allows a corn plant's life span to range from 90 to 200 days, depending on the individual variety and extent of warmth. The planted corn seed absorbs water and begins germination when soil temperatures remain above 50 to 65 degrees Fahrenheit. The radicle, or initial seed root, first emerges and grows downward, creating many side branching roots. The cotyledon, or embryo leaf, grows upward to the soil surface and once exposed to sunlight, unfurls and turns green. Over the next several weeks, the corn plant elongates to form a stem or stalk, producing three to 18 long, parallel-veined leaves sequentially as the stalk lengths. After the fifth leaf emerges, potential ear shoots develop and subsequent emergence of leaves occur during a time when the size and number of kernels develops in the ear shoots as warranted by growing conditions. Lack of sunlight, warmth or soil moisture affects future development of all corn cob parts. The corn cobs continue to elongate at the base of leaves, just beginning to reveal immature silky hairs from their tips. At the apex of the corn stalk forms the tassel, the branched structure of male flowers. Once ripe, the tassel sheds its pollen to the wind most heavily at dawn and dusk, reaching the female-gendered receptive silky, sticky hairs below on the husks of the corn cobs. Pollination extends for one to two weeks, when each silky hair must receive at least one pollen grain in order to develop into a kernel. Generally, two to four days' time leads to all silks receiving pollen. Twenty-four hours after a pollen grain touches a silk, fertilization occurs. The young kernel forms, known as a blister. Inside each kernel grows a plant embryo. During the milking stage, about three weeks after pollination, the embryo and its kernel swells and turns more yellow as it fills with starch. An additional week later, the kernels enter the doughy stage as they reach full size and moisture and starch content. Soon the kernels physically dent and begin to dry and ripen. On the exterior, the corn cob noticeably fattens while the once silky light colored silky hairs dry and brown. The tassel also browns and dries while no further leaf growth or development occurs. 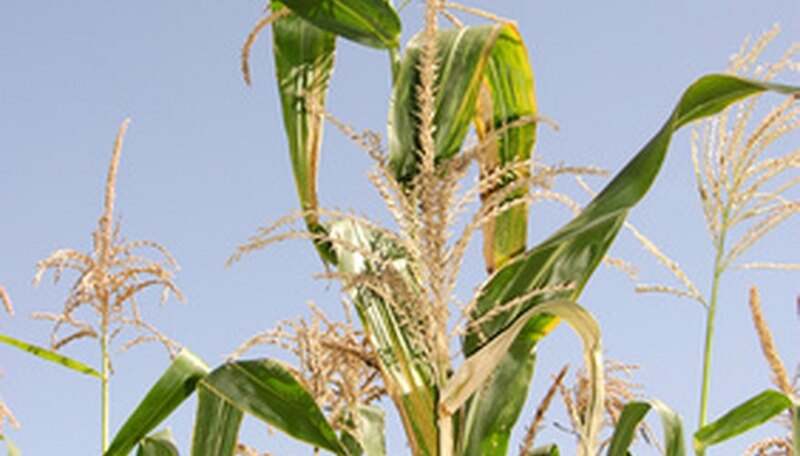 Once the kernels in the cob mature and begin to dry, the entire corn plant begins to degrade, aborting leaves as temperature or soil moisture dictates. The plant may or may remain green and photosynthesize up until a killing frost happens or the corn husks dry and fall away to release the kernels, now seeds, to the ground below.